Southern Italy: Naturist-friendly villa in Apulia (Puglia) comprising a traditional ‘trullo’ joined to a contemporary building. Panoramic views from the terraces and swimming pool. Peace, privacy and comfort in the heart of the countryside, and close to the sea. The property includes three bedrooms, lounge, two bathrooms, kitchen and covered outdoor terrace, and is set in 4000 m2 of mixed landscaped/natural gardens and grounds. The 12m x 6m swimming pool receives sun all day, and includes its own outdoor shower and bathroom. 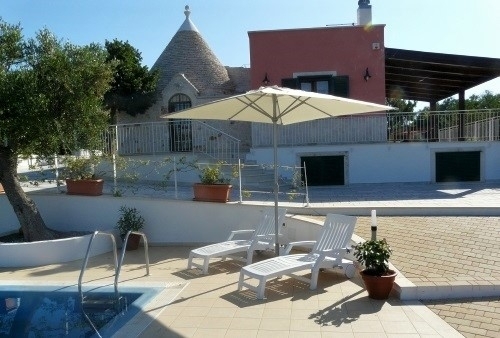 Located 7 km from the centre of Castellana Grotte, and 12 km away from Monopoli and beaches. 45 minutes from Bari airport, 1 hour from Brindisi airport.